« Be careful not to choke . 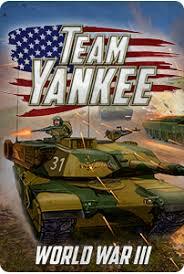 . .
A few of the members at the Club have recently started playing Team Yankee, a miniatures game from Battlefront (makers of Flames of War) based upon the concepts of a 3rd World War, set in the fiction of the same name by Harold Coyle. 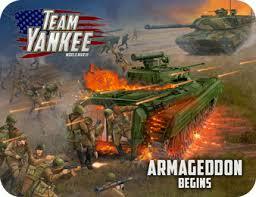 The premise of this game is that in the mid-1980’s, the Soviet Union launched a campaign against NATO forces, to capture and control Western Germany. 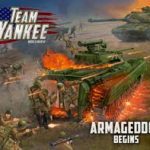 This game see’s you take command of a range of forces including tank battalions, ifv borne infantry companies, recce elements, ground attack helicopters and modern strike aircraft! So what’s this series of articles for? Well it’s to chart our progress with this game, and also to share it with you, and hopefully if you find it interesting . . . you might come and join us. Two weeks back the Club held a gaming day in order to support the local YMCA charity organisation; something that we do every year . . . figuring that Christmas time is when charities need funding support the most (we raised over £250 from that day!). 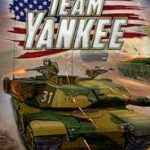 For TY (Team Yankee) myself and Matt decided to run through a campaign from the main rulesbook (thanks Matt for organising it), what we liked were how the forces needed were prescribed, and it gave us a strong narrative to follow which actually turned out to be a really fun way of getting some games in, learning about a spread of units, and getting insights into additional rules which we hadn’t yet encountered. Thanks for reading; catch you soon Comrades!